Another superb weekend! 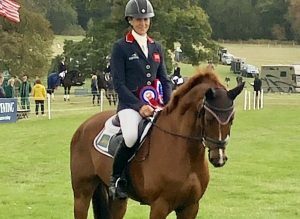 Our homebred mighty midget Carouet, aka Elfie, won the British Eventing 7 year old Championships at Osberton! He led from the start to finish on our dressage score of 25.5 with a fantastic double clear cross country inside the time. This little chap has the heart of a lion and gave me a great feel. He’s out of our 4* mare Lilly Corinne, by Balou du Rouet. In a difficult year where we had to retire his mum Lilly from the sport it means so much for her offspring to follow in her footsteps. His stable mate Quimira also had a great show finishing in 6th place, an unlucky pole costing us the one two. Next stop is the World Championships at Le Lion in a couple of weeks so this has been great preparation, wish us luck!